On the west edge of downtown, where trains once picked up passengers and freight, an old lumberyard is bringing new life—and art—to Brevard. The long-vacant site, formerly home to Brevard Lumber Company, is being transformed into the Brevard Lumber Yard, a five-building arts complex. The renaissance began a year ago, and in that time, the spot has played host to art demonstrations, including an iron pour, a film fest, community fund-raisers, and music video shoots. The Brevard Lumber Company opened in 1908, supplying millions of board feet that built homes and businesses in and around town. Once a center of commerce, it closed in the mid 2000s after big box retailers opened on busier boulevards. It and the rest of the Railroad Avenue area languished for years. There wasn’t much to hint at the district’s heyday when Leder drove by the property last summer. But given his experience working on a similar arts complex in Florida, he saw loads of potential among the empty buildings. He was also well aware of the town’s reputation for supporting the arts, and noted that Brevard College’s Porter Center and Brevard Music Center are within walking distance. “You just knew this place had a heartbeat,” Leder says. He made the owners an offer. As news spread, artists started to call, inquiring about staging exhibitions. 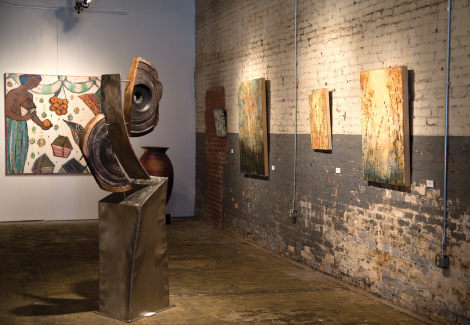 Within a few months, The Haen Gallery opened in a 14,000-square-foot space and began showcasing sculpture and contemporary art. Earlier this summer, work crews were retrofitting one building to house The LumberYard, a performing arts venue that will stage music and dance shows. Now open for special events, it adjoins an open-air courtyard where massive logs carved into sofas provide perches by a fire pit. Brevard and Blue Ridge Community colleges are slated to begin continuing education art classes in the district this month.